Transistors designed specifically as avalanche transistors are not nearly as common as ordinary switching transistors--so this circuit uses a selected NPN switching transistor. Not all transistors will operate in the avalanche mode, but many will. I've tested hundreds and more than half worked. The image below shows the circuit with the hidden component displayed. In operation, C1 charges through R1 until the collector-emitter avalanche voltage of Q1 is reached. Q1 then switches on, and C1 discharges through Q1 and the laser diode in a very brief pulse of 20 to 50 nanoseconds. The pulse delivers a current of up to 20 amps or so to the laser diode, which is not intended for continuous operation and is designed to be driven by a stream of high-current pulses. R1 is selected so that the laser's allowable duty cycle is not exceeded. R2 provides base bias to the transistor. The mystery component is an NPN switching transistor operated in the avalanche mode. I've built many near-infrared laser diode projects using this basic avalanche transistor driver. In fact, this is the circuit I used in a MITS laser diode project published in Popular Electronics several years before the company introduced the Altair 8800 microcomputer that resulted in Paul Allen and Bill Gates moving to Albuquerque, New Mexico, to develop software for the Altair and begin Microsoft. To the best of my knowledge, the earliest use of an avalanche transistor to drive a laser diode was by RCA in the late 1960s. I first saw the basic circuit in an RCA publication back then. A formal paper on this subject by Hansen and Schmidt is listed in the references. 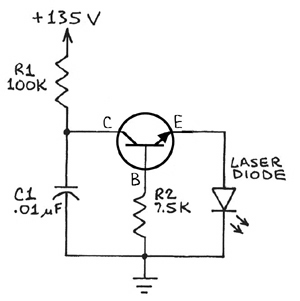 This circuit still has applications for driving pulsed, very high power laser diodes. For lower power laser diodes, a switched power FET is probably a better choice, especially since the power supply voltage can be significantly lower. J. P. Hansen and W. A. Schmidt, A fast risetime avalanche transistor pulse generator for driving injection lasers, Proceedings of the IEEE 55, Feb. 1967, 216-217. Forrest M. Mims III, Relaxation Oscillators Provide Compact Drive for Injection Lasers, Electronics, 88-90, July 19, 1971. Ibid., Understanding Solid-State Lasers, Popular Electronics, October 1971, 35-37, 42-45, 102. Ibid., Solid-State Laser for the Experimenter, Popular Electronics, October 1971, 53-37, 42-45, 102. Ibid., Operate Transistors in Avalanche Mode for Fast Pulses with High Current, Microwaves, 73, February 1973.